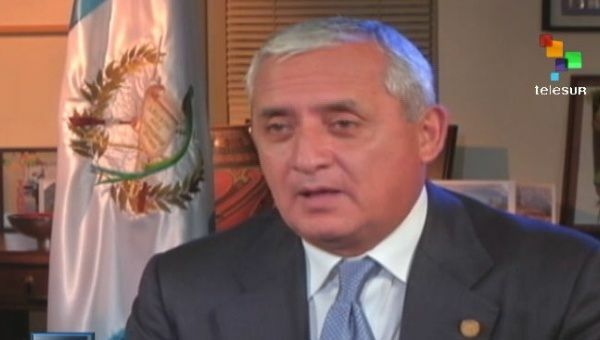 The country’s President tells teleSUR that a decision on legalizing marijuana will be made in 2015, while also acknowledging that Guatemala faces a serious emigration problem. In an exclusive interview with teleSUR, Guatemalan president Otto Perez Molina said that his government would follow the example of Uruguay by taking a decision on legalizing marijuana in early 2015. Perez Molina also stated that the most important short-term strategy of his government is to address the main problems in the country, especially emigration. The Central American leader spoke of the importance of working jointly with U.S. authorities in order to reduce the number of Guatemalans who emigrate every year, highlighting the support given by U.S. Vice President Joe Biden on the matter. “10 percent of Guatemalans have taken the decision to emigrate, nearly 1.4 million nationals live in the U.S., most of them have legal residency, but there are also many who are still undocumented, if we can find a solution to this problem that figure will fall,” he said. Perez Molina suggested that the Inter-American Development Bank (IADB) should also help to reduce the number of Guatemalan emigrants to the U.S. and expressed hope that U.S. President Barack Obama would issue measures that benefit Guatemala immigrants in the U.S. The Guatemalan president was also asked about the case of Guatemala's former dictator Efrain Rios Montt, who was found guilty of genocide in 2013 for his role in the killing of tens of thousands during the country’s brutal civil war. Perez Molina said that the trial was suspended, due to confrontation it caused inside the country. The 63-year-old Guatemalan President also served previously as Director of Military Intelligence.